The Malopeni Overnight Eco Trail is a guided one night motorised adventure trail which travels along management roads in the area to the north-east of Phalaborwa Gate up to the Letaba River. The route allows the adventure tourist exclusive access to remote areas which are not frequented by many vehicles and bring the true eco-tourist close to the realities of the African bush. Emphasis is on the wilderness, the remoteness and the seclusion of traveling through areas rarely seen by others. The trail will offer a variety of experiences which include seeing different animal spoor, animals, plant and bird species as well as a variety of different landscapes. A maximum of five vehicles limited to four persons per vehicle are guided by an official vehicle. This experienced and professional guide will act as the trail leader and will interpret the various natural phenomenon such as geology, biology, botany as well as historical and cultural information, at regular intervals. All vehicles need to be fully equipped in terms of their own camping equipment. • The trail starts at Phalaborwa Gate at 14:00 on the day of departure and returns to Phalaborwa Gate the following day at around 12:00 (campsite is vacated at approximately 09:00 after breakfast). • The overnight campsite is unfenced and has a fireplace, ashdrum and two enviro loo’s (toilets with no chemical or flushing component), one for ladies and one for gents. It is a self-catering trail and guests have to provide their own water, firewood, food and accommodation (Tent). Although it is not strictly speaking a 4×4 challenge, road conditions vary from reasonably good to a few places with steep inclines and in the rainy season – muddy patches where guests are asked to engage in 4×4 (if their vehicle has this capability). • Without 4×4 capabilities, wheels might spin and the road might be damaged and therefore it is recommended that 4×4 vehicles be used on this trail, however high clearance 2×4 vehicles are also permitted. Only genuine off-road trailers or caravans are allowed. • The trail departs on a daily basis throughout the year from Phalaborwa Gate although in the case of heavy rainfall the route might be changed or even be closed temporarily. The Phalaborwa Section Ranger can also close the route any time for management related issues such as an uncontrolled fire or for anti-poaching operations in the area. 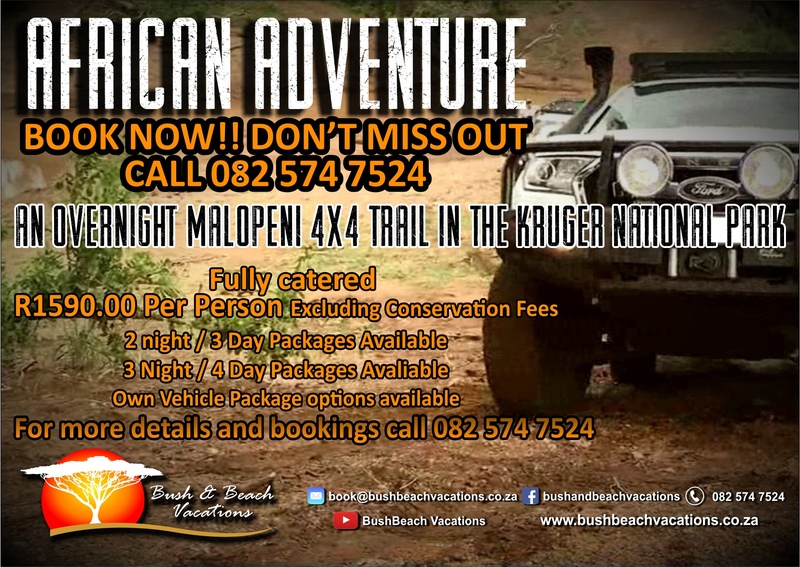 • Only 5 vehicles plus the guide’s vehicle are allowed on the trail at any one time, with a maximum of 4 people per vehicle. (No children under 12 years unless arranged prior to departure and this will only be possible in cases where one group has booked the entire trail).